yiwu vision trading co., ltd. has been dedicated to doing trade business since 2008, with offices in yiwu and ningbo in china and also in panama and cuba.. They are also setting up offices in vietnam and india to be in the forefront in the international trade. Yiwu vision trading co ltd have done international trading business in china for more than 20 years.They have more than 30 workers at the moment, with a good and solid foundation to provide their costumers with the best service possible. Their annual output is more than 150 containers of goods per year. 40% of our products are from yiwu and 60% of our products are from factories in taizhou, wenzhou, shantou, shenzhen, hunan and zibo. product lines: ceramics, glassware, house decorations, stationery, tools, toys, souvenir, hardware, daily-use goods, gifts & premiums, fashion accessories, garments, shoes, houseware and so on. 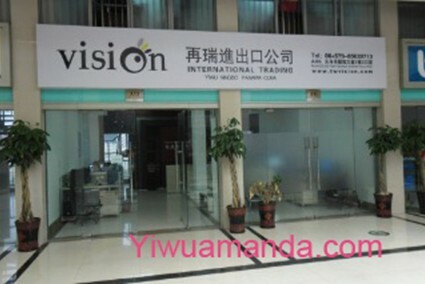 Yiwu vision trading co ltd care about our costumers and we would like to have a bright future with costumers. Long-term cooperation will benefit both of us. Have done international trading business in china for more than 20 years. Yiwu Dawson Import & Export Co., Ltd.